How Much Can I Make Before I Have to Pay Income Taxes on My Social Security Benefits? 1. How Much Can You Earn While Drawing Social Security Benefits? 2. When Does Income Not Make a Difference on Social Security Benefits? 3. What Is the Maximum You Can Earn and Not File Federal Income Taxes? As of September 2018, over 67 million Americans are beneficiaries of Social Security or SSI benefits. Social Security benefits are intended to supplement income and help defray costs of living for people who have retired or who cannot work. Social Security income isn't taxed the same way regular income is taxed, and so only some Social Security beneficiaries are required to pay taxes on their benefits. Those who do have to pay tax do not pay tax on the entire benefit amount. Only individuals who earn income over a certain amount from other sources are required to pay federal income tax on their Social Security benefits, and even then, they are only be taxed on a percentage of the benefits and not on the entire amount. After the stock market crashed in late 1929 and the Great Depression took hold in the United States, the country sunk into an economic catastrophe. Many proposed solutions were submitted over the next several years until finally, in 1935, President Franklin D. Roosevelt signed the Social Security Act into law. The purpose of the law was to promote general welfare but also to provide an income stream to retired workers. Today, benefits are paid to people of retirement age but also people who are disabled and cannot work or can only work part-time. The program is funded by taxes deducted from the paychecks of employed individuals, who then see the returns once they retire. The Social Security Administration calculates your benefits based upon your lifetime earnings at the time your benefits start, which are adjusted to account for changes in average wages since the year you received the earnings. The average adjusted monthly earnings during the 35 years in which you earned the most are calculated, and then a formula is applied to arrive at the basic benefit you'll receive when you reach 65 or older. So your benefit will depend upon how much you made over your working life, how much you paid into the Social Security fund and how old you are when you start collecting the benefits. Importantly, if your only source of income is Social Security, you will likely not owe any tax on your benefits. However, if you earn income from other sources, such as a job or a business, you may be taxed on your Social Security benefits up to a certain amount. Social Security taxable income limits change periodically; the calculation is based on "combined income," which is your adjusted gross income plus any nontaxable interest, plus one-half of your Social Security benefits. For example, if your adjusted gross income from your job is $30,000 per year and your Social Security benefits total $12,000 per year, and you have no nontaxable interest, your combined income is $30,000 plus $6,000 (one-half of your total $12,000 benefit) for a total of $36,000. As of 2018, if you're an unmarried individual, you will not pay taxes on your Social Security benefits if your combined income is less than $25,000. If your combined income is between $25,000 and $34,000, you will need to pay tax on up to 50 percent of your benefits, and if your combined income is $34,000 or higher, you may be taxed on up to 85 percent of your benefits. For example, if you're single and you make $30,000 in adjusted gross income from your job and Social Security benefits of $12,000 per year as set forth in the example above, your combined income is $36,000, and so you may be taxed on up to 85 percent of your $12,000 benefit. If you're married filing jointly and your combined income along with your spouse's is less than $32,000, you will not pay taxes on your benefits; you will pay tax on up to 50 percent of your benefits if your combined income is between $32,000 and $44,000, and you'll pay up to 85 percent if your combined income is $44,000 or higher. If you're married but filing separately and you lived with your spouse during the tax year, you can be taxed on up to 85 percent of your benefits regardless of your combined income. If you do owe taxes on your Social Security benefits, you have two options for paying them. You can pay them by making estimated quarterly payments to the IRS, or you can fill out a form with the SSA and have the taxes deducted from your benefits before you receive them, just as your taxes are deducted from a regular paycheck. Some people make so little income that they're not required to file a tax return. Whether you're required to file depends on how much taxable income you make. If your only source of income is Social Security, you'll probably not be required to file, because none of the income counts towards the filing requirement. However, if you make income in addition to Social Security, you may still have to file depending upon how much you make and whether any of your Social Security benefits are taxable. The filing requirements have changed for tax years 2018 and onward. Prior to 2018, single filers under the age of 65 who made less than $10,400 per year (not including Social Security) were not required to file tax returns; that number rose to $11,950 for single filers age 65 or older. 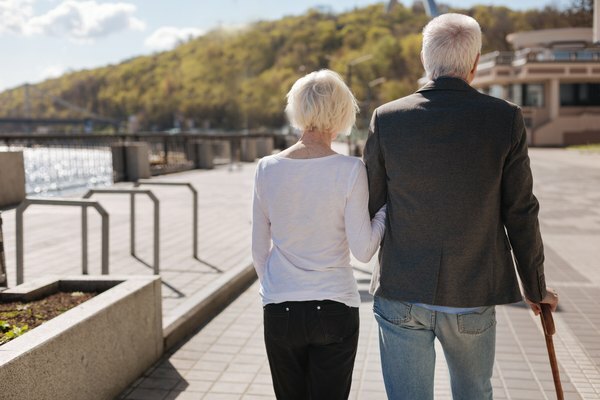 Married filers who were both under 65 did not have to file if they made less than $20,800 together; if one spouse was under 65 and one was not, the threshold was $22,050; and if both spouses were 65 or older, the threshold was $23,300. Married couples filing separately had a low threshold of $4,050. The rules were different for widows and widowers and heads of household. The Tax Cuts and Jobs Act, signed into law by President Donald J. Trump in December 2017, changed the filing requirements and eliminated the age limits. The new law uses the standard deduction as the threshold number for filing a return. For the 2018 tax year and onward, your age doesn't matter when it comes to figuring out whether you have to file a return. Your filing status is the only threshold. For single individuals or married individuals filing separately, you must file a return if you made $12,000 or more in taxable income. If you're head of household, that figure is $18,000, and if you're married filing jointly, you must file a return if your joint taxable income is $24,000 or more. These rules are true regardless of your age. Based upon 2018 tax year requirements, if you're a single individual and you make less than $12,000 per year in taxable income plus $12,000 in Social Security benefits, you won't have to file a return, because none of your benefits are taxable at that threshold and your other income does not reach the minimum amount. Forbes: Do You Need To Pay Tax On Your Social Security Benefits? IRS: Are Social Security Benefits Taxable? IRS: Do I Need to File a Tax Return? Rebecca K. McDowell is an attorney focusing on creditor and debtor law. She has a B.A. in English and a J.D. She has written finance and tax articles for Pocketsense and eHow. Do You Pay Federal Taxes on Social Security Retirement? How Much Social Security Tax Do You Have to Pay? Do Social Security Benefits Count as Gross Income? Do You Have to Pay Federal & State Tax on SS Retirement Benefits? How Much Can a Retired Person Earn Working & Still Draw His Social Security Benefits? How Much Can Someone Born in 1937 Who Receives Social Security Benefits Make? Does My Ex Husband Have to Be 62 Before I Can File Social Security Benefits on His? Can You Stop Paying Federal Income Taxes at Age 70? How Much Money Can a Dependent Make & Still Be Claimed on Income Taxes?